Today’s technology is truly mind-blowing. My mother and aunt come from a generation where having a crown seated in your mouth would take multiple lengthy visits to the dentist. Thanks to advanced computer-aided design and computer-aided manufacturing (CAD/CAM), dentists can create high aesthetic, metal free restorations in a single visit without the need of impressions or temporaries. How do dental professionals accomplish this feat? With CEREC. CAD/CAM computer software is used to both design and manufacture products. In the world of dentistry, a specific computer supported process known as CEREC is used to create all-ceramic fillings, crowns and veneers. CEREC stands for Chairside Economical Restoration of Esthetic Ceramics (or CEramic REConstruction). This development means that no impressions, no temporaries and no second appointments are needed to get a crown or filling. Dr. Jessica T. Emery of Chicago’s Sugar Fix Dental Loft always has the most up-to-date technology and machinery in her office. She is a proud owner of the CEREC 3-D system which allows her to scan, design and mill crowns all within one appointment. The icing on the cake being that there should never have to be another appointment because CEREC restorations are equivalent to gold. Meaning they last a lifetime. First, Dr. Emery will glide a handheld camera over a patient’s teeth to generate a three dimensional model in color. As the data is transferred from the camera to the computer, you will be able to see the photorealistic image on the monitor while sitting pretty in your chair. Next Dr. Emery will design and fabricate your crown restorations in office with you there. Imagine it. You will get the chance to witness your new crowns being created in a machine a few feet away from you. 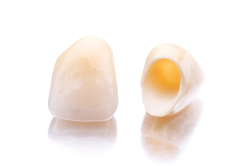 The necessary crown or filling will be milled out of a ceramic block within the CEREC milling unit. Under a blue light, water will be sprayed onto the ceramic block to keep it cool while the crown is cut to match the exact measurements needed. When the blue light turns green, the crown is finished and good to go. Go where? On your damaged tooth! Pretty impressive, no? The finalized restoration will then be taken out of the milling unit, glazed and baked before being perfectly placed in your mouth. Call Dr. Emery at Sugar Fix Dental Loft today to learn about same day crowns using CEREC technology. Dr. Emery is more than happy to go over the treatment process and advantages of single visit restorative dentistry. Aesthetic dentistry plays a role, too. The restorations match your natural tooth color and shape. No one will know you ever had damage to your original teeth and are currently living with restorations behind that smile. Show the world you are experiencing the most optimal quality of life by displaying attractive healthy teeth.